Have you ever felt like walking at the bottom of the ocean and seeing what goes on down there? It is our first time experiencing the Bali Seawalker. It was exciting, and also safe. Swimming skills are not necessary. Simply put on the oxygen-filled and climb down the ladder from the boat to start walking on the sea bed! Only thing to note to slowly descent as you may experience ear block (due to pressure) otherwise. Once down, simply follow guide’s instructions and enjoy the view while feeding the fishes! Definitely recommend to those who have not tried yet! Walk at the bottom of the sea without getting your hair wet — nope, that’s not a trailer for a new sci-fi movie, that’s the reality. Seawalker is a soft dive system that is designed specifically for those who are not confident swimmers or do not wish to dive. 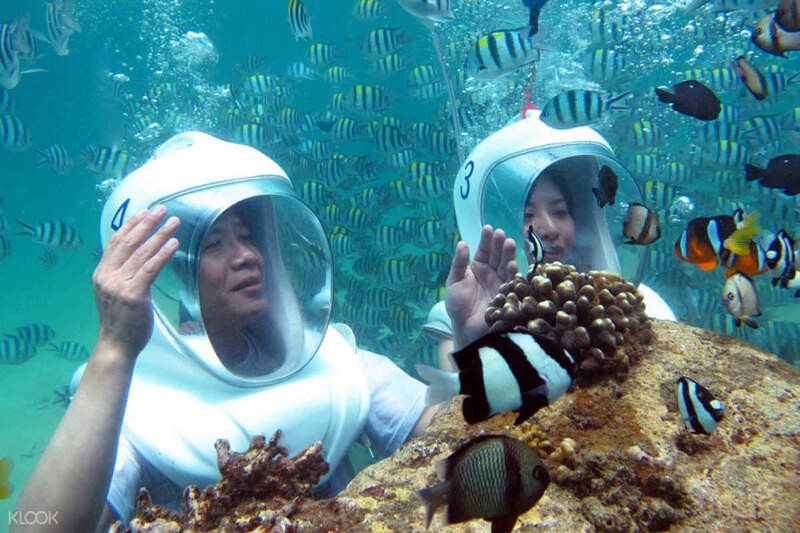 All you will need to do is put on a helmet with a transparent visor and head on down to explore Bali’s stunning underwater life with a professional guide. 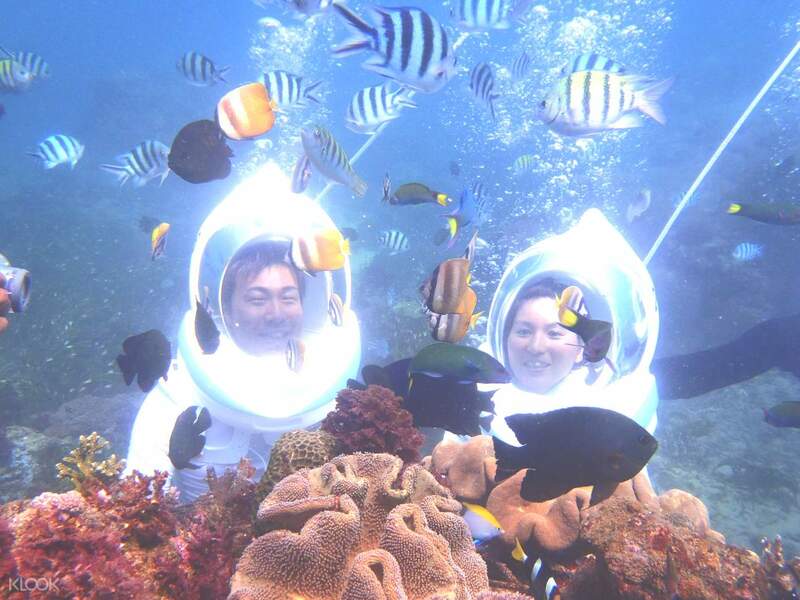 Walk at the bottom of the sea and come face-to-face with exotic marine creatures. With no air tank necessary, you will get to discover the bottom of the ocean in full. The experience is complete with convenient hotel pick and drop off and all the needed seawalker diving gear. 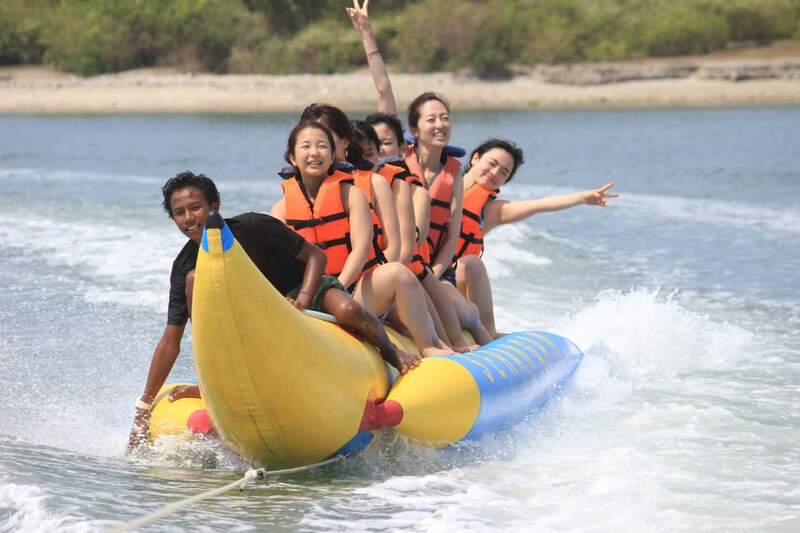 Try out other exciting activities such as the banana boat! the driver who came to pick up in Ubud confirmed the pick up time well in advance. the staff at the activity centre were very friendly and ensured we were comfortable. I throughly enjoyed the sea walker and jet ski. Also booking through KLook was a lot cheaper than booking the activities on the center. the driver who came to pick up in Ubud confirmed the pick up time well in advance. the staff at the activity centre were very friendly and ensured we were comfortable. I throughly enjoyed the sea walker and jet ski. Also booking through KLook was a lot cheaper than booking the activities on the center. Enjoyed all the water activities! Our guide was patient, he told us to take our time to play while he waited in a hut at the side. We paid an extra 30USD for photos to be taken for us so we could just enjoy to our fullest. And since we were already there, we topped up for a parasailing adventure. Enjoyed all the water activities! Our guide was patient, he told us to take our time to play while he waited in a hut at the side. We paid an extra 30USD for photos to be taken for us so we could just enjoy to our fullest. And since we were already there, we topped up for a parasailing adventure. Great experience! We were assigned 1 diver to 2 customers, he really took care of us and made sure we were alright throughout. They gave us bread to feed the fish so they came swarming around us and we could see them up close. Very safe and amazing chance to explore the seabed for those who can’t scuba dive! Great experience! We were assigned 1 diver to 2 customers, he really took care of us and made sure we were alright throughout. They gave us bread to feed the fish so they came swarming around us and we could see them up close. Very safe and amazing chance to explore the seabed for those who can’t scuba dive! It is our first time experiencing the Bali Seawalker. It was exciting, and also safe. Swimming skills are not necessary. Simply put on the oxygen-filled and climb down the ladder from the boat to start walking on the sea bed! Only thing to note to slowly descent as you may experience ear block (due to pressure) otherwise. Once down, simply follow guide’s instructions and enjoy the view while feeding the fishes! Definitely recommend to those who have not tried yet! 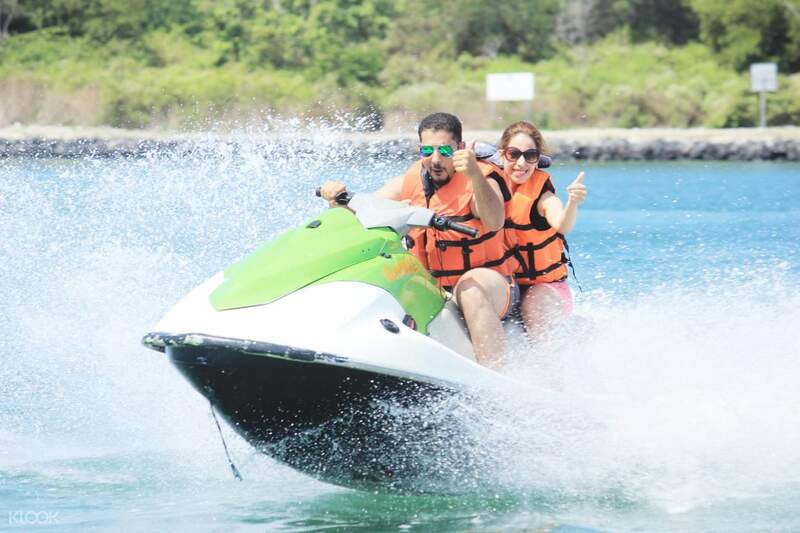 It is our first time experiencing the Bali Seawalker. It was exciting, and also safe. Swimming skills are not necessary. Simply put on the oxygen-filled and climb down the ladder from the boat to start walking on the sea bed! Only thing to note to slowly descent as you may experience ear block (due to pressure) otherwise. 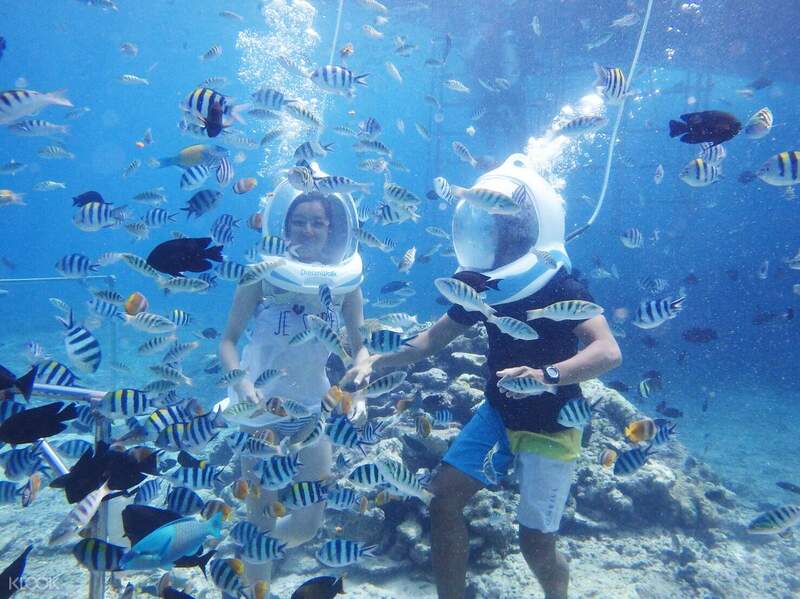 Once down, simply follow guide’s instructions and enjoy the view while feeding the fishes! Definitely recommend to those who have not tried yet! The whole package is pricey, but considerably MUCH more affordable than if we had gone there and booked activities individually. They’re not pushy about you trying other stuff and locker comes with the package. Do bring a towel though! The whole package is pricey, but considerably MUCH more affordable than if we had gone there and booked activities individually. They’re not pushy about you trying other stuff and locker comes with the package. Do bring a towel though! Nice place and coach was very nice and friendly. Nice place and coach was very nice and friendly.